We will consider any rhetoric that protests our torture of prisoners to be a threat to the safety and security of the CDCr, and that language will be banned from our institutions. So, any publications that reference such rhetoric will be rejected by our mail handlers. We do not care about the First Amendment of the U.S. Constitution, because our authority is to protect the public by all means. And we cannot do this with a lot of red tape, nor can we do this without torturing prisoners by holding them indefinitely in solitary confinement. Therefore, solitary confinement is very necessary. We further note that we may now be allowing prisoners to have electric typewriters, combo televisions, radios, excess canteen etc., but if they get two serious CDCr 115s (Rules Violation Reports) within a six month period, we will assert our authority under the new proposed regulation titled “program failure” and strip them to their bare necessities, meaning all of their appliances (radios, TVs and the like) and excess property will be sent home. That means we didn’t really give them anything, because we can manufacture these serious 115s, citing confidential information by way of our many informants, 1030 disclosure forms, debriefings, staff information, talking on the yard or in the building, and take it all away. These are some of the many ways in which we can strip them of their property, based on these proposed new regulations. So if we get this passed as policy [the comment period for the new regulations is open until Tuesday, June 17 at 5 p.m.], then it’s open season on these guys for real. We can trash their cells during searches and if they respond negatively, then write them up a serious CDCr 115 Rules Violation Report, an RVR. We can feed them slop however we see fit, and if they say something negative in response, write them up a serious RVR. We can write them up in the law library for many violations, play with their canteen and packages, yard; you name it, we can do it now, under these new proposed regulations. We literally can hammer these guys now. We have put ourselves in a better position to screw these guys and many will not even see it coming. We do it all under the authority of CDCr policy. Hell, we should be very excited about the position we are in, because we got the STG (Security Threat Group, the new term for “gang”) I and II and the SDP (Step-Down Program) on the books as policy and we didn’t even have it challenged. Now they are eating out of our hands to get to the DRB (Departmental Review Board, which is interviewing prisoners in solitary confinement to see whether they belong there). We basically just widened our field of play. We can lock up anyone we desire to under the STG I and II and the SDP. Hell, this is 10 times better than indeterminate SHU, under prison gang validations. We get the whole enchilada now! And we got four years to hold each and every one of them. We have a pool of 130,000 prisoners to choose from, and guess what? We can bring them back to solitary confinement any time we want to. We got nothing to worry about, because, hell, we locked some of these guys up for 30 to 40 years straight on BS and didn’t pay any of them one cent, nor were any of our officers prosecuted, and we know that a lot of these validations were in clear violation of the law, an injustice where we subjected these guys to all kinds of physical and psychological torture and got clean away with it. And we have a more elaborate system to continue business as usual. We got each and every one of them right where we want them. When looking at them today, what has changed? And I say to all my officers, not a damn thing changed! We good, so continue to get your overtime and make your money and remember that working in solitary confinement pays extras. We good! Oh, and support the legislators for a job well done in writing SB 892. Though we [Mutope is now speaking in his own voice] are in the 21st century, the CDCr is using its authority and power to retaliate against prisoners in order to break our will and spirit. Although the method has changed, the results remain the same. The method can be openly brutal, as we see in the Southern states, where our New Afrikan brothers and sisters are beat down and murdered, while being treated like 1700s or 1800s slaves, working in chain gangs, while prison guards ride horses with shotguns, looking like something straight out of the movies. But when you start analyzing exactly what’s going on inside California prisons, you will begin to see that we too are being beat down and murdered, as if we too were in the 1700s and 1800s. Actually, it’s been equally as devastating for us as it is for our brothers and sisters in the Southern states. Prison policies have been constructed so that each and every prisoner has been subjected to pain and punishment over the past 25 years. The CDCr policy makers have used CCR (California Code of Regulations) Title 15 to attack prisoners in every aspect of our lives – medical, food, property, politics, privileges, custody, education, law library, yard, sanitation etc. No matter the level of attacks, it’s always been done to establish and constantly remind us that we prisoners are under oppressive prison conditions. The policy changes are not something the CDCr even tries to hide. It seems as if their sole purpose for introducing policies is to subject the prisoners to inhumane treatment. We have seen, since our first and second hunger strikes, that the policy governing hunger strikes (CDCr Chapter 22 and 23 and Operational Procedures (OP) 228), under the warden’s authority, was changed, simply because they could not subject prisoners to “physical harm.” So, after we came off our first hunger strike, the CDCr turned around and changed the hunger strike policy, the OP, to allow them to subject prisoners to some kind of pain and punishment, although they had arbitrarily carried out attacks against us even when the initial hunger strike policies were in effect. The CDCr uses these prison policies in order to subject prisoners to physical and psychological harm. The reason CDCr went back and changed their proposed policies was so that they could retaliate against prisoners for their peaceful protests. Although they laid claim to false security threats to the institutions, they never proved anything. So, why would it be a threat to the safety and security of the institution now? The policy [new proposed censorship rules, officially called “Obscene Material” regulations] is in retaliation for prisoners telling our personal horror stories, while carrying out hunger strikes in protest of such cruel and unusual punishment inside solitary confinement. The CDCr is neither ashamed nor remorseful for the pain and suffering they inflict on so many human beings. Instead, they are constantly trying to find ways to silence prisoners and further subject us to more pain and suffering. These retaliatory policies are designed to do just that. We have to challenge the CDCr’s blatant retaliation on prisoners. *CDCr is the acronym for the California Department of Corrections and Rehabilitation; prisoners often write the last letter in lower case because rehabilitation is nearly nonexistent in California prisons. Our Five Core Demands of the hunger strikes have not been met. And we see that reform always equals revisionism, which means it’s no change. Reform is a word that provides one, or a people, temporary fixes. It does not change their circumstances, but instead gives an impression that they have achieved change. Reformism is an age old practice that has been used on oppressed people throughout the world for centuries. As our oppressor, CDCr is employing the very same tactics now because they have not been able to bring about the change they have promised. The food has literally gotten worse, although for a month they attempted to adequately feed us. The medical care continues to be inadequate. The educational programs and privileges are not afforded, and prisoners are still made to suffer in these inhumane conditions, now familiar to us for years on end. The Departmental Review Board (DRB) under no circumstances can meet the demands to remove all those prisoners who they illegally placed in solitary within a respectable amount of time. Neither the CDCr secretary nor the undersecretary can credit themselves with making changes, just because one man who was held in solitary for 40-plus years was recently released from the Pelican Bay State Prison Security Housing Unit (PBSP SHU). They are trying to act as if they are moving in the right direction, while there are countless others suffering in the same reality, solitary confinement. This in itself is an insidious and malicious criminal act, which each and every prison official who had a hand in this or allowed these crimes against humanity to occur for so long, should be held accountable for to the highest degree of the law. It is disheartening to hear or read politicians reference that prisoners be subjected to three years in solitary for a mere validation alone, criminalizing a status based on gang title. It is this tolerance that sanctions CDCr’s torture and inhumane treatment of prisoners and condones solitary confinement in all its capacity. Would you want to be placed in solitary based on a gang validation, which you have no control over, even though you deny the gang accusations? The lawmakers have to be brave and set the tone for how the law is to be interpreted and applied by all means. Paraphrasing what Undersecretary Hoshino said: The regulatory process is subordinate to the legislative process. So, if Sen. Loni Hancock is serious and committed to changing the inhumane treatment and deliberate torture that subjects record numbers of prisoners to solitary confinement indefinitely, then she has to reject the STG (Security Threat Group) I and II, along with the Pilot SDP, step down program, because it further sanctions each and every prisoner being held in solitary to more and more years in isolation. No. 1. Increase insight and accountability: Reading this, we feel that we have done a very poor job of educating her and the legislative body as to our pain and suffering, because under no circumstances can the Office of the Inspector General (OIG) or the Office of Internal Affairs (OIA) be established as the independent oversight entity because that has been their job since their inception, and they have failed to adequately provide proper oversight. The result has been prisoners being subjected to cruel and unusual punishment for well over 40 years. To regard the OIG and the OIA as being in a position to do an objective and sufficient job in overseeing the CDCr, is like having the lion watch over the lamb! We need real change when it comes to an independent oversight that has no ties to CDCr. No. 2. Integrity and fair treatment in detention decisions: We see this as something that will always be subjective, because we see individuals go before the Departmental Review Board with the exact same infractions and time spent in solitary confinement, yet one gets put up for Step 1 and the other gets put up at Step 5. This is a subjective judgment because both had political literature; both had 30-plus years in solitary, no disciplinary problems and definitely no gang activity. Yet the DRB assessed both men differently in their case by case review. Why? The fact that the DRB feels they corrected an unjust, inhumane act in which a man suffered immeasurably for 43 years is unacceptable. The only just action is to release this man back to his community. No. 3. Humane conditions in the SHU (Security Housing Units or solitary confinement): I cannot see how the legislators can make solitary confinement humane! It is an impossible task and apparently Loni Hancock did not get what the families were saying, because if she rightfully heard the public, the families’ cries and prisoners horror stories, in her sense of humanity and empathizing with family members, under no circumstances would she be talking about making this inhumane environment more humane. It’s ludicrous and impossible. No. 4. Positive incentives for inmates to change their lives: What about the countless positive prisoners, like myself, whose life was changed way before we were placed in solitary confinement? I am all for change, but yard is required by law; phone calls, visits and photographs should never be classified as “privileges” because these are all family oriented activities. I see positive incentives for prisoners by way of adequate educational programs that allow prisoners to be reconnected to 21st century Amerika, college degrees, trades and vocational skills etc., where we learn a profession, making sure each prisoner can efficiently read and write and understand the political and economic landscape of this country. Programming prisoners should live in healthy social conditions that are beneficial to them, instead of conditions that foster the socially dysfunctional behavior cultivated through social engineering toward our demise. The Five Core Demands will allow these incentives to be met. I would add that I commend Loni Hancock for being brave enough to openly say what we have been suffering for all these years by being subjected to inhumane conditions. But we see no change, and I realize that this bill was only submitted in mid-March and has a long way to go, through a long, drawn out process, while prisoners continue to suffer now. There isn’t the sense of urgency that was present at the Feb. 11, 2014, Public Safety Committee hearing. CDCr Undersecretary Hoshino reiterated several times in his testimony that they “need time.” This means that they have no intention of changing these conditions for the long haul. The state of California, the governor and legislators need to find another economic incentive for CDCr and the CCPOA prison guards union, because this is where the problem lies. Under no circumstances can they end these solitary confinement torture chambers as long as CDCr and the CCPOA are able to make millions of dollars off of placing prisoners into solitary confinement. Undersecretary Hoshino refers to 97 percent of the prisoners who have gone before the DRB being released or on their way to being released – and that’s out of 700 people reviewed thus far. But what he failed to mention is that for every prisoner released, two more are put in their place, thus creating a revolving door simply on the basis of a gang validation, NOT on BEHAVIOR. Again, 80 percent of the prison population are validated as gang members or associates, whether they are or not. This is a fact. The real problem is that the state has found a way of giving millions of taxpayer dollars to CDCr officials without requiring bad behavior by us prisoners as a pretext to do it, yet we are made to suffer under torturous conditions. The only way to end long term solitary confinement is to stop paying for it. This dirty little secret is far too lucrative for CDCr and the CCPOA to let go of it. My value back here in the Pelican Bay Short Corridor, as an individual, is $70,000 annually. Multiply that by 14,000 California prisoners in solitary, including Ad Seg; the total is nearly $1 billion! For profit we suffer! End long term solitary NOW! Send our brother some love and light: Mutope Duguma (James Crawford), D-05996, PBSP SHU D2-107, P.O. Box 7500, Crescent City CA 95532. This letter was written in April 2014. We human beings are a political, social, cultural and economic force trapped within the colonial powers of our oppressors’ system, in and out of prison. Our struggle is for absolute self-determination and liberation on a national and international level, by way of changing from scientific capitalism into a scientific socialist system, which is crucial for changing and ending human suffering. It’s human beings who are the practitioners of progressive theories, which we utilize as a guide for action in our progressive struggle, from the founding of our humanist ideology. We have always presented ourselves as educators committed to the liberation of all oppressed people of the world. We realize that our oppressors, the exploiters of the people of the world, will never end their aggression and exploitation where there exists no progressive society to challenge such aggression. Even behind the walls of the prison industrial slave complex, PISC, a system of human degradation will continue to exist, wherever there exist no progressives. We hold the responsibility to fight against the capitalist exploiters of the world. We welcome the ability to serve the interests of humanity. We are comprised of seasoned educators who are committed to the growth and development of education of all human beings and are rooted in the truths that afford all human beings to exercise the fullness of their potential, bringing into existence a society that represents a true civilization under justice, freedom and equality for all. This civilization will allow most, if not all, to be educated. This civilization will allow most, if not all, to be educated around politics and economics with the intent to serve the interests of all humanity instead of the small few, as we see today. We realize none of this can be achieved without the coalescing of the people’s power – a power that has to be precise and decisive in how it goes about bringing into existence the political and economic system of scientific socialist principles. Our responsibilities are totally to the oppressed people of the world, and it will be incumbent upon us to give the oppressed masses moral and physical support, express genuine love toward the people and learn all we can from them so that initiatives in our struggle can be carried out, to resist our oppressors. It is here that we as a lower class people will begin to formulate more ideas around our protracted struggle. The oppressed masses are truly linked to struggle and will have a significant role as we liberate ourselves from our oppressor’s grip in all sectors of society. If we are to be true servants of the people, we have to be rooted in the practice of selflessness. This is the only way we can begin to champion the people’s causes progressively. All activities we participate in as progressives concerning growth and development should be of benefit to the people. We always have to be mindful in the quest for the people’s liberation that our struggle includes resisting selfishness and materialistic values that encourage the “me” society. The growth and development of the people is our task in our struggle to be free, but in order to achieve such a task, we have to be equipped with the knowhow to bring about political and ideological development through our progressive organizing around our scientific socialist principles toward meeting the peoples’ needs. We can very well achieve this task through our philosophy of “each one teach one.” This responsibility can only be efficiently embraced by our masses by bringing about a new breed of human being: women, men and children who adhere to the concepts of love and respect for all progressives and fellow human beings. The women, men and children who embark on this progressive journey by challenging the inhumanity, injustices and rampant poverty that have subjugated the oppressed to a state of constant conflict and oppression in which millions are dying daily and living half butchered lives – they will be the leaders of the 21st century. We can seriously study and see where the errors of our ways have set us on a course that has stagnated our growth and development by not understanding the true methods to employ so as to achieve our objectives as an oppressed lower class of people. We see people struggling in all areas of oppressed societies, no matter where we are in the world, as Alina of France, Annabelle of The Netherlands and Penny Love of San Francisco can testify so eloquently. They all clearly understand how the oppressed people of the world continue to be exploited by the very small group of rich human beings. As long as we can agree on how to achieve our objectives for the greater good of all human beings, then we should never fall out with each other just because we believe in different methods, strategies and tactics to reach a common objective. It is essential that we all keep foremost in our minds at all times that the objectives take precedent over the individuals. And that the struggle is about bringing principles into practice for the greater good of humanity. 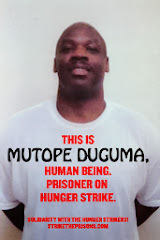 Send our brother some love and light: Mutope Duguma, s/n James Crawford, D-05996, PBSP SHU D2-107U, P.O. Box 7500, Crescent City CA 95532. This is a glimpse into torture by prison staff, using any means available, of which solitary confinement at Pelican Bay State Prison in California is only a reflection of the inhumane treatment and clear U.S. constitutional violations of our First, Fifth, Eighth and 14th Amendment rights that prisoners in solitary everywhere are subjected to. The objective of the deprivation method is not complicated. It is to attack the sensory organs and perception with methods to impair them. The weapon of deprivation cannot be effective without having in place a conditioning process to produce degeneration over a long period of time. The psychological, social and cultural trauma is observable in such a sterile and punitive environment. Deprivation is cannibalistic for the spirit that is willing to stay the course. The flesh becomes weakened as men feed on themselves and others, eating away at human excellence. The feasting of deprivation will become more than flesh, blood or nature can endure. Indeterminate SHU confinement has left individuals with having to choose between discontinuity and becoming inflicted with a cannibalistic nature. There are two aspects of deprivation, the psychological and the physical, where the mind acts upon the body. This two-edged torture can be effective either way. But in order for deprivation to eat away at the targeted prisoner’s consciousness, a conversion reaction must occur that breaks down the psychological defense mechanism. Medical: Honorable Judge Thelton Henderson ordered a receivership to oversee CDCr’s PBSP SHU due to intentional medical neglect which led to prisoners dying, as frequently as one a week, in the California Department of Corrections and Rehabilitation system. Many of these deaths were, and continue to be, in solitary confinement. This is torture. Solitary confinement: Prisoners are held in isolation for 10 to 40 years despite having only non-disciplinary infractions during that time. This is torture. Mail: Prisoner mail is being used to create physical and psychological torment. Mail can be arbitrarily withheld for weeks on a regular basis, and has been known to be withheld for years, even when there are court orders to release the mail to a prisoner being unjustly deprived. This is torture. Food: Food is intentionally prepared poorly, contaminated and disproportionate. Nutritional food is deliberately denied. This is torture. No human contact: Prisoners have no real, meaningful social interaction with other human beings, especially family and close friends. Our five senses – touch, sight, smell, hearing and taste – become dulled from deprivation. This is torture. Visiting: Constantly, under the CDCr gestapo style agency of correctional safety, the Investigative Service Unit (ISU) and Institutional Gang Investigators (IGI) and other such units deliberately intimidate visitors and prisoners. This is torture. Cell searches: These are used to intimidate, harass and trash prisoners’ cells, leaving them in disarray while taking political writings, pictures, manuscripts, books, pamphlets, magazines etc., causing psychological torment. This is torture. No sanitation: Prisoners are deliberately kept in unsanitary units. For example, showers are allowed four times a week, but the showers are cleaned only twice a week. There is an abundance of mold, mice, bugs, gnats, fungus etc. This is torture. Climate: Prisoners are kept in freezing cold or burning hot cells, depending on the time of year, a complaint that has been made for over 21 years. This is torture. Contraband watch, or potty watch: It is humiliating, dehumanizing and outright cruel and unusual punishment when prisoners are held in shackles and placed in the middle of a hall while being placed on a portable “potty,” while cops (female too) and prisoners with escorts are walking by. There are reports of prisoners being placed in cages, without a toilet or running water. Men are placed in a diaper with a prison jumpsuit over it, while the victim’s hands are bound into a fist-wrap. PVC pipe forced onto arms and black boxes over the hands have also been used. The prisoner is required to defecate three separate times during a three-day period. The torment and suffering are truly visible on the prisoner’s face. This is done to cause severe humiliation, along with mental, physical and psychological torment. This is torture. Family: Each validated prisoner’s family is deliberately harassed, intimidated and intentionally hoaxed into false prosecution for a thoughtless crime by gestapo-type units (OCS, ISU, SSU and IGI) with the intent of discouraging any support or communication with the prisoner. This is torture. Grievances: The 602 appeal process, at each of its three levels is deliberately set up to not afford a prisoner relief, regardless of whether prison officials are dead wrong in their accusations. This clearly establishes that there is no accountability for what officials do to prisoners. This is torture. In addition, the structural features of the various solitary confinement units throughout the U.S. prison industrial complex (PIC) make it possible to target specific prisoners by utilizing sensory deprivation to undermine the social, cultural and ethical values that the targeted prisoners hold. Prisoners are rare who can escape the ravages of the torture that results from long term isolation and the negative assaults by guards in any of California’s supermax control units and similar units all over the U.S. The science behind the use of deprivations has been perfected by the handlers to operate with devastating force. We know there is no separation between physical torture and mental torture. Torture is a double-edged sword that can slice effectively either way to exact punishment or revenge. It has the purpose of taking away a targeted prisoner’s human dimension and essence.